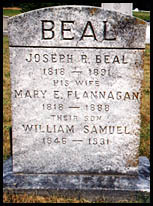 Comments: William 'Billy' Samuel Beal was born in 1846 in Scottsville and was the son of Joseph R. and Mary E. (Flannagan) Beal. Growing up in Scottsville, Billy worked as a clerk in his father's general store, located in the Beal Building at the south corner of Bird and Valley Streets. When his father died in 1892, Billy shared ownership of the store with his brother, Jackson Beal. Billy also served for many years as Scottsville's Town Constable and was also a Past Master Masonic Lodge #45. Beside Billy Beal's photo on the Masonic Lodge wall is a copy of a newsclipping from The Scottsville Register, dated January 14, 1871. It describes a Scottsville ferry boat in trouble on the icy James River and that Billy came to its rescue: "One of the most exciting and distressing sights we ever witnessed, was on Christmas morning, at the Scottsville Ferry landing. The ferryman, Mr. Peter V. Foland, assisted by young Willie Patteson, had started to carry two men across the river, cutting the ice as they went, and after getting within 75 yards of the other shore, they discovered, to their horror, that the ice thus cut loose was slowly moving upon them, and in a moments time came upon the boat, when they jumped out upon the ice and one of the men (Brightberry Toney) being more excited than the rest, ran upon the ice and broke through, drowning in a few minutes. Mr. Foland, Willie Patterson, and the remaining man (although they had fallen into the water) succeeded in climbing upon a large piece of ice and remained upon it until the citizens on this side had carried a large number of planks from the shop of the J.R. & K. Co., (which fortunately was nearby) and laying them across each other, formed a walk to them, by which means they affected their escape from their perilous position. It is our duty to add that our young friend, Mr. William S. Beal on this occasion, was most efficient, and deserves all praise. The boat on which the party attempted to cross the river and which was sunk by the ice, was found by Mr. John Butler, a few days since, one mile below town; but the body of the misfortunate (drowned) man has not been seen." A lifelong bachelor, Billy's home was located on Valley Street near Victory Theater as shown in the photo at right. Although since razed, the Palace is remembered fondly for its broad front porch where old Civil War veterans gathered to watch town life and to discuss their war experiences. In the 1890's, the Palace was also the site of an incident, popular in town legend, as described in Virginia Moore's Scottsville on the James: "And sometime in this period, Miss Etta Harris did a peculiar thing. Her mother kept a store across the street from the quaint cottage called 'The Palace,' home of Miss Etta's longtime bachelor fiance, Billy Beal; a store at which ladies bought lace, corsets, and pretty hats. Mother and daughter lived above. Nobody knew why Miss Etta did what she did---took a pot shot at Billy one night when he came outdoors to fetch firewood. Needless to say, the engagement was broken." 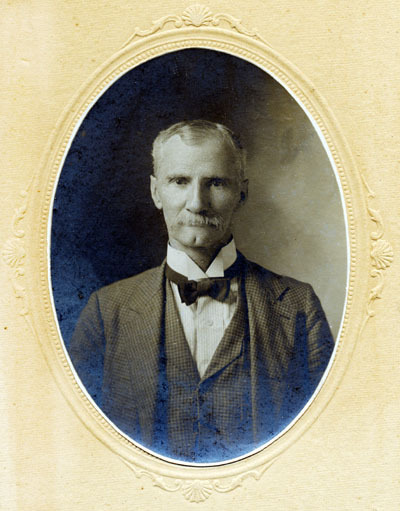 In 1931, William Samuel Beal died in Scottsville. He is buried at Scottsville Cemetery next to his mother and father and shares their gravestone.